Israeli Occupation Forces (IOF) on Tuesday opened live fire at a group of Palestinians for allegedly approaching the border fence between Gaza and Israel, shooting and moderately injuring two young men. Local sources said that Israeli forces stationed at military watchtowers along Gaza borders fired live ammunition at the Palestinians claiming they got too close to the border fence to the north of Beit Lahiya, in the northern Gaza Strip, injuring one in the leg while another was wounded to the east of Breij refugee camp in central Gaza Strip. Both young men were taken to nearby hospitals for treatment and their condition was described as moderate. Palestinians in Gaza have been marching peacefully since 30th March along Gaza’s eastern borderline for their right of return. Dozens have been killed and thousands injured as a result of Israel’s use of lethal force against the unarmed protesters. Head of International Committee of Red Cross (ICRC) sub-delegation in Gaza, Gilan Devorn, has called on Israeli occupation authorities to respect and ensure the unimpeded functioning of medical services for the wounded and sick. In a statement on Saturday, Devorn expressed his deep regret over an incident in which a medic from the Red Crescent was wounded by Israeli fire while performing his work in the north of the Gaza Strip. 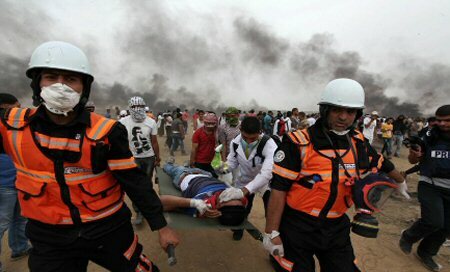 “Today, a medic at the Palestinian Red Crescent Society was shot while he was evacuating a wounded man in the border area. We look into the circumstances surrounding the incident, but the medic was clearly visible, wearing the Palestinian Red Crescent vest standing near the ambulance. Such incidents must stop,” he said, according to Al Ray Palestinian Media Agency. “With the increasing violence, ensuring that medical services for wounded and sick are unimpeded is extremely important. The PRCS has worked courageously and tirelessly to fulfill its humanitarian mission,” he added. Médecins du Monde (MDM) Chapters working in Palestine yesterday expressed their deepest concern regarding Israel’s violent response against Palestinian civilians demonstrating near the perimeter fence in the Gaza Strip. 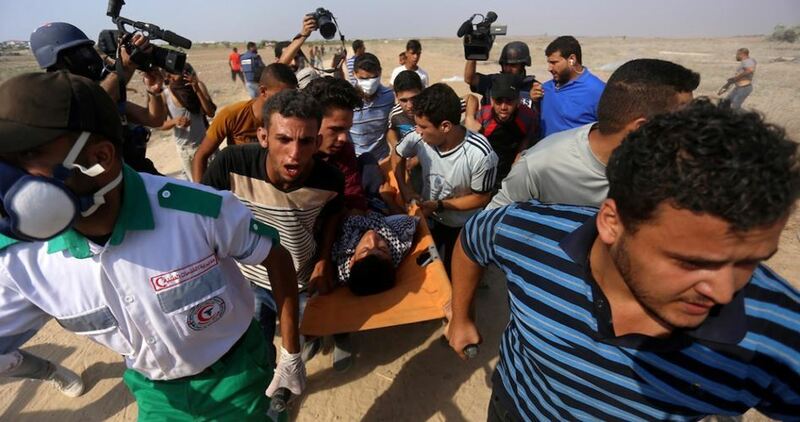 Highlighting a World Health Organisation (WHO) report, the MDM added that more than 99 healthcare staff have been injured and 18 ambulances damaged as a result of Israel’s violent response to the unarmed protesters. “So far, the hospitals in Gaza have treated 4,045 victims with severe injuries, 18 per cent of them are under age and less than half of the urgent patients requiring referral to other hospitals outside Gaza have received the necessary exit permit from Israel,” the statement said. They urged the European Union to take concrete measures in order to implement the EU Parliament resolution 2018/2663(RSP) calling for the immediate and unconditional end to the blockade and closure of the Gaza Strip. Israeli occupation authorities announced yesterday that there would be no travel permits for Palestinians in the Gaza Strip during Ramadan this year. According to the Times of Israel, the Israeli military said it had approved “a series of civilian measures for the holiday period” in the occupied West Bank, a reference to a loosening of routine movement restrictions. Such a step typically takes place every Ramadan. The Times of Israel added that “the measures will allow Palestinians in the West Bank to see family members in Israel”, to “travel abroad from Ben Gurion Airport”, and to visit Al-Aqsa Mosque. However, the Israeli news site continued, “these will not apply to Palestinians who live in the Gaza Strip” despite the fact that “in previous years, residents of the coastal enclave were given some special dispensations for Ramadan — normally in the form of permits to visit Jerusalem”. The Israeli occupation authorities decided not to grant these permits following a “situational assessment”, an Israeli military spokesperson said according to the Times of Israel. Reports in the Israeli media suggest that the Israeli military has made changes to its open fire regulations for soldiers repressing Great March of Return protests in the occupied Gaza Strip. According to Maariv correspondent Tal Lev-Ram, writing last Friday, the Israeli army “internalised lessons” after the first two weeks of the protests, which began on 30 March, following a “very high” death toll amongst Palestinian demonstrators at the hands of Israeli snipers. According to Lev-Ram, as a result of such “lessons” being learned, the number of fatalities has decreased each week. Lev-Ram further reported on Sunday that the lack of fatalities amongst Palestinian demonstrators this past Friday was “not coincidental” and reflected changes in how the Israeli army has dealt with the protests. On Monday, Haaretz military correspondent Amos Harel similarly reported that the Israeli army “is now showing more restraint in handling these demonstrations”. The illegal Israeli settlement of Efrat has become the first to use drone technology to observe Palestinians in the surrounding area, according to the Jerusalem Post. The $37,000 unmanned aerial device was paid for by the International Fellowship of Christians and Jews (IFCJ) and is the first time settlers have been given such high grade equipment to monitor Palestinians. A demonstration of the technology on Sunday showed how a small black drone could even observe Palestinians in the night with the use of thermal cameras. The settlement council claims that the drone is needed to protect residents from Palestinian resistance attacks, after an alleged stabbing incident this year left one person with minor injuries. “We are going to have this drone in our own yard in case we do have any other terrorists who want to come into Efrat. We will be able to raise the drone into the air, freeze the situation, get a good visual picture and direct the army and police forces to exactly where the terrorists are hiding,” Council Head Oded Revivi said. However, it is more a regular occurrence that Palestinians are harassed and assaulted by settlers and Israeli soldiers, as well as being already disadvantaged due to the presence of the settlement. Efrat, the fourth largest settlement built on private Palestinian land, has a road for settlers which Palestinians are only allowed to use during daylight hours. The road cuts off nearby Arab residents from their farmland. Last week, Israeli human rights group B’Tselem reported that Palestinian school children from Al-Jalazun refugee camp in the central occupied West Bank also face violence and disruptionthanks to the proximity of their school to the illegal Israeli settlement of Beit El. Israeli occupation forces “use teargas, rubber-coated metal bullets and, in some cases, live fire”, B’Tselem continued, adding that camp residents, including minors, “have been killed and injured”. The NGO also found that Israeli settlers attacked Palestinians in the West Bank village of ‘Einabus with the assistance of Israeli soldiers last week. Two Palestinians were attacked by settlers from the notorious Yitzhar settlement as they paved a road on their farmland. Some 50 villagers then went to protect their lands, after which the settlers returned accompanied by soldiers who fired live bullets and tear gas at the Palestinians. With the drone now ready for use in Efrat, IFCJ founder and President Rabbi Yechiel Eckstein said his organisation plans to provide similar drones to other communities in Israel, including those along the Gaza border. “The security of the citizens of the State of Israel is one of the most important areas in our remit and we are certain that this drone will help the residents and significantly increase their personal safety,” Eckstein added.